Well, I'd first like to thank whoever's Idea it was to separate the forum like this, its very helpful! I have plans for this section of the Forum, I'll share a few of them here. Multi-Universal comparisons: This will be very lore driven (given my interests and the nature of this forum section), I will basic do a full break down and analysis of fleet comps and capabilities between universes and see how they may perform in battle against each other in fleet units. You may think it'd be one-sided in favour of 40K, but after reading around, its actually closer in many cases than you may think. Stories! : Pretty much self explanatory. Return to ship profiles: starting up ship profiles again in here, may use a different format (since finding pictures for some ships is... difficult) but it should be fun! Great idea! Not sure if I have enough knowledge or writing quality to contribute much, but I will certainly enjoy to participate on the discussions. 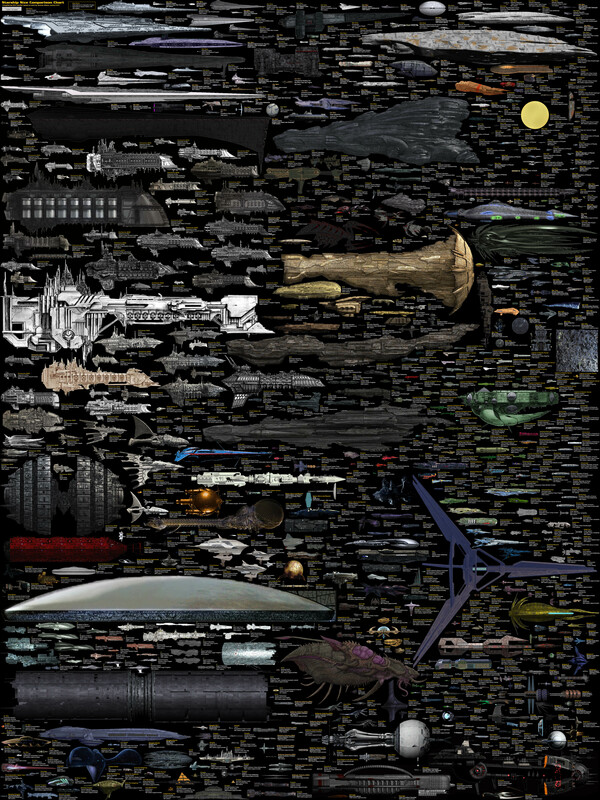 About cross-universe fleets comparison, I think we must have this pciture around! Necroledo wrote: Great idea! Not sure if I have enough knowledge or writing quality to contribute much, but I will certainly enjoy to participate on the discussions. About cross-universe fleets comparison, I think we must have this pciture around! It's more than just 'this ship vs that ship' I'll be doing. How many ships do/can they field? What tactics would they commonly employ? I know a lot about 40K and Star Wars, as well as a fair amount on Star Treck and Sins of a Solar Empire for comparisons of that nature: but I need help and more reasearch/time before I can do further comparisons. Hi, everyone! First of all, I'd like to say that I'm excited to register here! I'm pretty sure that this forum is a great chance to find out a lot of proper solutions! Furthermore, the following thread is helpful for everyone. Just go to http://bigessaywriter.com/blog/top-30-t ... -to-nature and browse this article for your individual needs! Glad to see your future plans, especially for the ship profiles I do enjoyed! Are you familiar with the Uplift series by David Brin, or the Honorverse? I feel like those might be interesting comparisons that I haven't seen done before. Rolepgeek wrote: Are you familiar with the Uplift series by David Brin, or the Honorverse? I feel like those might be interesting comparisons that I haven't seen done before. No, but if you can send me materials I'd be happy to do it. For the Honorverse, since I suspect there's a great deal more info on it, maybe even some specific energy numbers, though I'm doubtful on that point, here's a few links. Apologies for it being so general, but there's a lot of stuff that you'd want to go through, if you even want to bother. Light Attack Craft, the closest thing they have to fighters or bombers. Battlecruisers, which were not used in the same way as Imperial Navy Battlecruisers whatsoever. Infantry Weapon Tech, which should be useful as a portal towards infantry info and the like, if it would even come up in such a face-off. CALiGeR190 wrote: Well, I'd first like to thank whoever's Idea it was to separate the forum like this, its very helpful! Not sure if this is the right place to ask but I'll do so anyway. I have 3 requests for Multi-Universe Comparisons. The Halo comparison is seriously stretching it. The Paris Heavy Friagte (assuming that's the ship you're talking about) has a single MAC cannon somewhere between 12 Megaton and 50 Gigaton range (depending on MAC model and calibre), and that's the most powerful weapon it has. Light Macro Cannons are in the 1-2 Petratone range. I could still potentially do the comparison maybe with a Claymore corvette though. I don't really want to take as many speculative rule stretches as I did for the Intrepid, I didn't feel comfortable at all doing that. I don't know anything about the Deliverance... send me materials, I see what I can do. Which Gloriana? They vary massively from ship to ship. If you want a 'generic' Gloriana than Amphion is probably best, but the Iron Blood is what is most commonly seen. Last edited by CALiGeR190 on 28 May 2016, 16:12, edited 2 times in total.